What do lens terms mean? | Stop Shooting Auto! ← What is focal length? What do lens terms mean? If you’ve just gotten your first dSLR, you’ve probably already thought about buying another lens to go with it. Maybe you want something that will let you shoot telephoto, or wide angle, or macro. Maybe you want something faster. Most likely, you don’t know what you want, but somebody told you that the kit lens wasn’t very good and you believed them. You did what anyone would do, and started surfing the web looking at lenses. Pretty soon, your head was swimming and your eyes were glazed over after looking at all those lens terms. What’s an EF-S? What does 70-200 mean? Why is that lens so much more expensive than the one that seems like the same thing? I’ll do my best to unravel it all for you, though I’ll warn you up front that some of this is Canon-specific. If anyone wants to write a guest entry and explain Nikon-specific terminology, or terminology for other brands, leave me a comment. First off, an easy one. 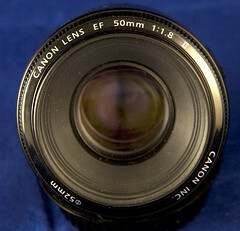 The writing on the front reads “CANON LENS EF 50mm 1:1.8 II CANON INC. (theta)52mm”. This is the Canon “Nifty Fifty” 50mm lens. (It’s a steal at around $75, and I highly recommend picking one up if you shoot Canon.) The “CANON LENS” is easy enough that I won’t insult your intelligence by explaining it. 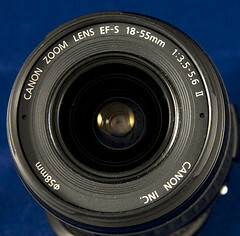 “EF” is a Canon-specific term, and it stands for Electro-Focus. This is the type of lens that is used on the Canon EOS line of SLRs. As of this writing, all digital SLRs are EOS-type cameras, so if you have a Canon dSLR any EF lens should work. Some lenses are EF-S rather than EF. The S stands for “sticks out in back” or something like that– the back part of the lens sticks out a little farther than an EF lens. If you have the Canon 18-55 kit lens, it’s an EF-S mount. EF-S lenses work on almost all Canon dSLRs except for the high-end professional models. “50mm” is the focal length of the lens– I explained what focal length is in the previous entry. 50mm is kind of a mid-range focal length, neither long enough to be telephoto nor short enough to be wide-angle. It’s a good general-purpose length. “1:1.8” is the maximum aperture of the lens– the widest that it can open. The term “1:1.8” means exactly the same thing as f/1.8, and we all know what f-stops are now, right? Right? I’ll be perfectly honest here and say that I’m not certain what the “II” means, but I’m guessing it means something like “Version 2”. On the other side of the lens it says “CANON INC.” and then “52mm”. That last number is the size of the filter threads. Almost all lenses have threads on the outside that will let you screw a filter onto the front, either to protect the front glass from damage or to add some sort of special effect. On this particular lens, the diameter of the threads is 52mm, which means that you need to buy a 52mm filter if you want to add a filter. It is common practice and a very good idea to keep a UV filter on the front of your lens at all time, to protect the lens from damage. Here’s the Canon kit lens. It’s a lot like the previous one, but a little bit more complicated. Notice that instead of “CANON LENS” it says “CANON ZOOM LENS”. The word zoom means that the lens can change its focal length. In the previous example, the 50mm lens was always 50mm and you couldn’t make the focal length any longer or shorter. In the case of a zoom lens, there’s an extra ring on the lens that lets you zoom in or out to get closer or farther away from your subject. In this case, if we look just a little bit farther on the lens, we’ll see “18-55mm”. That means that the lens can zoom out to be as wide as 18mm, or zoom in to get as close as 55mm. You can, of course, use any length in-between those as well. Zoom lenses are nice because they let you have a lot of flexibility in how the image looks without having to change to a different lens. I’ve already explained the “EF-S” part, but I’ll remind you that it’s Canon-specific. Now it gets interesting. The maximum aperture is listed as “1:3.5-1.5.6”. We already know that means f/3.5-f/5.6, but why would a lens have more than one number? As it turns out, zoom lenses are really nice to use, but they’re harder to make than fixed-focal-length (also called “prime”) lenses. Some zoom lenses have the same maximum aperture at both their shortest and longest focal lengths, but sometimes the maximum aperture changes. When you see two numbers, the first one is what the maximum aperture is when the lens is at its shortest focal length, and the second one is at its longest. In this case, that means that when the lens is zoomed out to 18mm, the widest possible aperture is f/3.5. When it’s zoomed in to 55mm, the widest it can open is f/5.6. As you can probably guess, if you’re in the middle of that range the maximum aperture is somewhere between those two values. Finally, this lens has 58mm filter threads. There are a few more terms you’ll commonly see for Canon lenses. “USM” stands for ultrasonic motor, and specifically the motor that is used for focusing. All you really need to know is that USM lenses focus faster than their non-USM counterparts, and they’re quieter. “IS” stands for image stabilization. This is a piece of real technical magic that helps get rid of camera shake on longer exposures. It can be extremely useful for getting shots where you can’t quite hold the camera steady enough to get a solid shot. It won’t help you with moving subjects, and it won’t do any good for very long exposures, but it’s great when there’s almost but not quite enough light. IS lenses are much more expensive than their non-IS counterparts, though. And finally, some Canon lenses have the “L” designation. This stands for “Ludicrously Expensive.” OK, not really, but it might as well. Canon L lenses are their top-of-the-line professional models. They are generally the highest-quality lenses that Canon makes, but they come with a high price tag. I hope that helps, at least a little. Again, if someone wants to guest author a similar article about Nikon or other brand lenses, leave me a comment. I thought it was something related to small sensors, but the computer says no. Golly, Wikipedia really does know stuff. tells me that the II on the Nifty is indeed the version number, the original had a metal mount, it seems. Thanks for this post. Very interesting. I have the kit lens on my Rebel XT. Would you recommend getting a better overall “all-purpose” lens or get familiar and master the kit lens and get the 50mm you mentioned in your post (as a second lens purchase)? mvivas, I’d definitely recommend mastering the kit lens before you get a better one. The biggest problem with the Canon kit lens (and by that I mean the 18-55 f/4.5-5.6) is that it’s slow. By that I mean that you have to have a lot of light for it to be usable– f/4.5 and f/5.6 aren’t very wide. The kit lens is also a little bit soft when it’s wide open, but if you use it at about f/8 it’s not bad at all. You almost certainly have plenty of room to improve your technique before the kit lens becomes a limiting factor. Not surprisingly, most lenses are at their best around f/8-f/11. My personal strategy for buying camera gear is to do so when I have a specific need that isn’t filled by the gear that I have. If you’re saying something like that, then by all means go shopping! However, if you just have a sort of nebulous “want something better” reason, then you may find yourself disappointed by a new lens. Thanks for your reply. I’m still in the process of mastering the kit lens (and yes, it is the one you specified above) and your points are well valid. I am getting into the hobby of carrying my camera more often with me so I can take lots of photos and see where my new passion leads me. Thanks, and great blog. I Read all your posts in order. EF-S lenses “fit” on Canon’s professional DSLR cameras (you can attach it to the camera body, focus, etc.) BUT you may do serious damage to the camera or lens if you try to shoot with this type of lens attached. This is because these lenses fit deeper into the camera body, and the mirror will hit the back of the lens when you try to take a photo. What is the definition of a macro lens? The lens that they sold me when I asked for a macro lens, is a Tamron SP Di 90mm 1:2.8 Macro requiring a 55mm lens cap. (don’t know how to type that symbol). 2.8 doesn’t sound particularly big to me. Especially when your Canon kit lens gets down to 1.8. Sounds like the nifty 50 is a better macro lens than the one they sold me. Is it the combination of a longer focal length and a large aperture that makes it a macro lens? Here’s the nontechnical definition: a macro lens is something that can focus really really close, so you can take cool pictures of bugs and flowers and coins and stuff like that. Often lenses can only focus as closely as a couple of feet away, but with a macro lens you can focus inches away from the front of the lens. The technical definition is a little bit more complicated. A macro lens is a lens that can focus closely enough that the image on the film plane (in this case the sensor) is at least as bit as the actual object. So if you’re taking a picture of a penny, the penny will be penny-sized or bigger when it falls on your sensor. Technically, macro has nothing to do with aperture or focal length– it’s just how closely you can focus. However, true macro lenses are almost always primes (they have a fixed focal length rather than being able to zoom), and they typically have both a wide maximum aperture and a narrow minimum aperture. On my Sigma 105mm macro lens, I can open the aperture as wide as f/2.8 or as small as f/45. The Tamron 90mm macro lens has an excellent reputation, and I think you’ll be happy with it. Shooting macro can be hard work– you often have a depth-of-field of a millimeter or less– but it can also be incredibly rewarding. You’ll almost always want to use manual focus mode for macro work, and adjust the aperture so that you get a reasonable depth of field. I took some pics of trapeze artists recently. One of the shots I attempted, was taken while lying on my back and shooting up through the net. I got a very cool profile of the performers, but the net kinda ruins the picture. I understand that two things will make the net go away. One is getting very close to it and the other is making the aperture as wide as possible. Well, I can’t get too close to it because when the performers dismount, they land in the net and it’s very bouncy. I’d probably get squashed. It’s about 8′ up off the ground anyway. If I could mount the camera on a long stick and hold the stick under the net while i stood at the edge, that would work (if my arms could manage to hold it still, which is questionable). So what’s left is to have the aperture wide open and manually focus. In that regard, I’m wondering if this is a place where my macro lens might come in handy. I know macro lenses have other valid uses besides macro photography, but not sure if this is one of them. My regular zoom lens takes reasonable shots at f/5 and 1/640 or so. But because the zoom consumes light, I have a hard time getting the aperture to open much wider than f5. The lens is 18-200mm f/3.5-6.3. And according to the EXIF data on flickr, I’m out at about 84mm. Am I going about this correctly? Is my thought process logical? Do you think a macro lens might work better? A macro lens just allows really close focusing. Macro lenses do usually have fairly wide maximum apertures, though, which is why you’re thinking it might be useful. If you’re shooting at about 84mm right now, then a 100mm macro lens would probably work as well, and you could open the aperture to f/1.8. I would either find a way to make the net work for you, or find a way to get out from under it. If you want to play around without being there, go find a fence with an object that’s about the right distance away, and try some experiments. That will let you try out techniques without time/performance pressure. Wonderful post even though I’m still trying to understand the “photography” terms. I’ve always enjoyed taking photos but it wasn’t up until recently that I really started to get more time into it. I recently had a daughter and I have been doing a lot of photography of her. I bought a Nikon Coolpix P510 thinking I would be set but boy was I wrong. I recently returned it and I’m now on the search for a camera again. I love the bokah effect in photography. I don’t need a super high-class camera, just something I can create the type of photos I want and have fun with on spare time. I think I want to stick with Nikon, I hear they’re simpler than Canon, which I like. I was also told to get a prime lens, 1.8. It sounds like you know a lot more about photography than I do. Do you have any advice or suggestions for me as I continue my search? Anything is helpful. Thank you. I don’t think you’re going to find that Nikon is simpler than Canon or vice versa. I recommend going to a camera store and seeing how both models feel in your hands. Some people have a strong preference for one or the other, but most people would be perfectly happy with either line. When you pick out a camera, play with it for a while then come back and run through the Exposure Lessons, In Order. Do the exercises too.